Australian voice-over artist Lofty Fulton knows what it’s like to have the odds stacked against him: Born with achondroplasia, which is a form of dwarfism, his grandmother thought he should be locked away from the world. At school, he suffered years of relentless bullying, believing the lie he would never be loved or good enough. At 15, Lofty’s voice broke, giving him a unique gift that paved the way for his future. 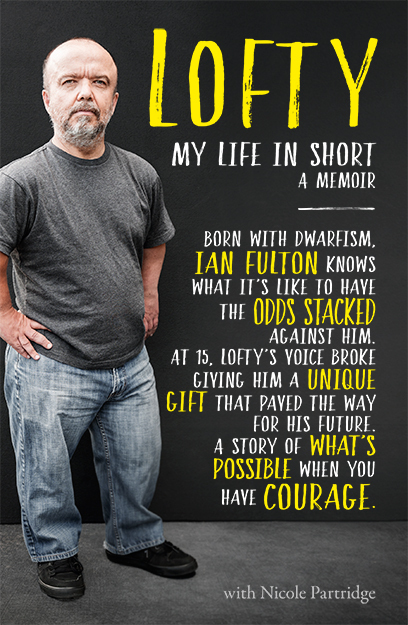 Lofty: My Life in Short is a deeply personal memoir – of vulnerability and courage and humour as Lofty unpacks the events of his traumatic childhood, public bigotry; a failed marriage, the highs and lows of a successful radio career and his struggles with crippling general anxiety disorder, clinical depression and a serious gambling addiction. Lofty’s story is a collusion of light and shade; a reflection on what it means to be human, to search for meaning and purpose. From brokenness to breakthrough, Lofty has slayed many of his inner demons, rising to become one of Australia’s most sought after and recognisable voices.